These are my designs and they are posted here for the Graphic 45 Design Team Audition 2015. 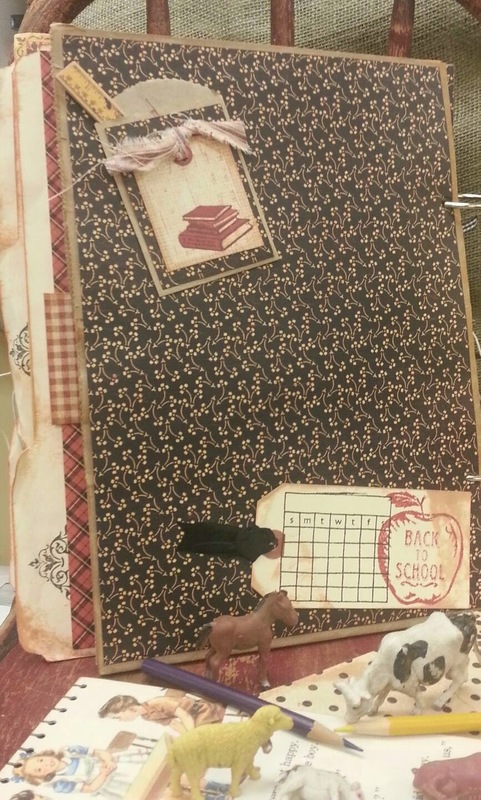 This is a school memory book. 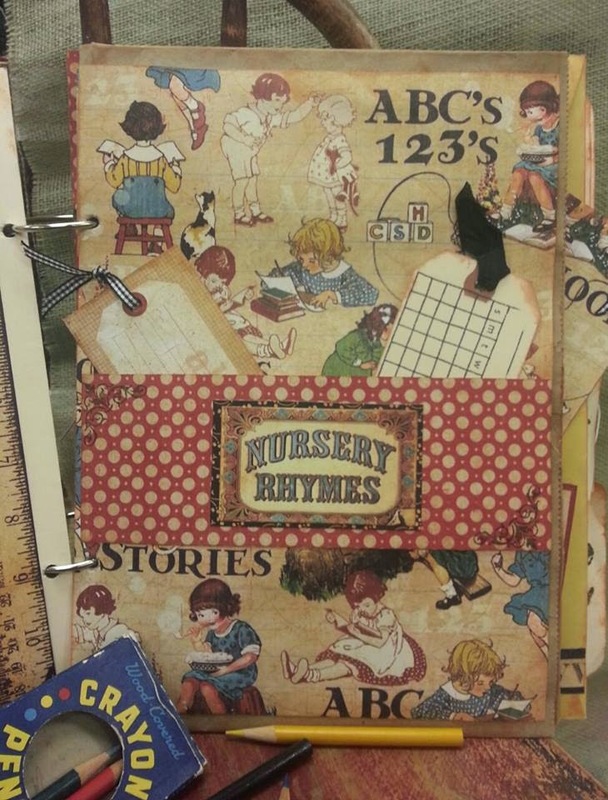 I made it for my grandson for when he starts school. 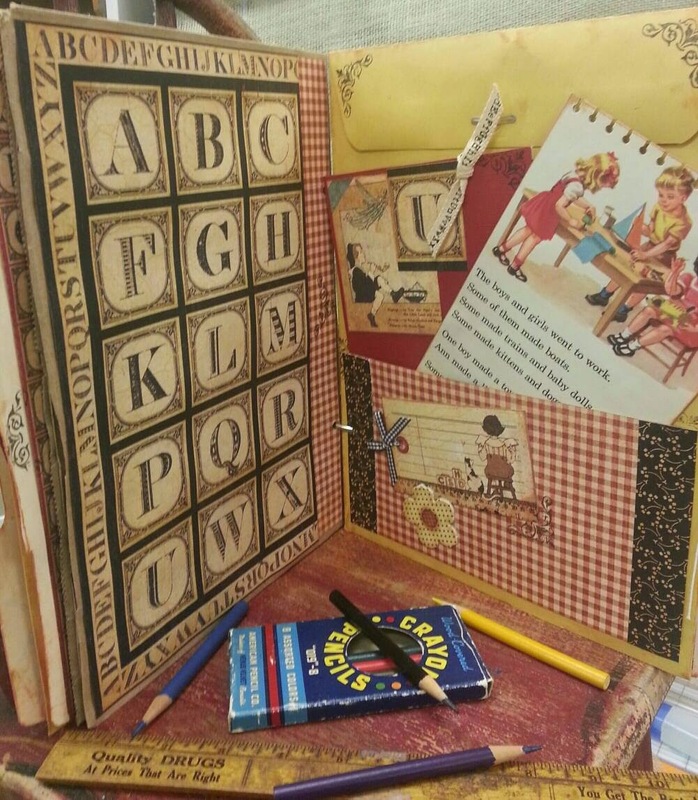 It will hold a lot of memories for grades K-5. I made it using the G45 ABC Primer paper. I used large paper grocery bags so there is a pocket on the inside for his art work. 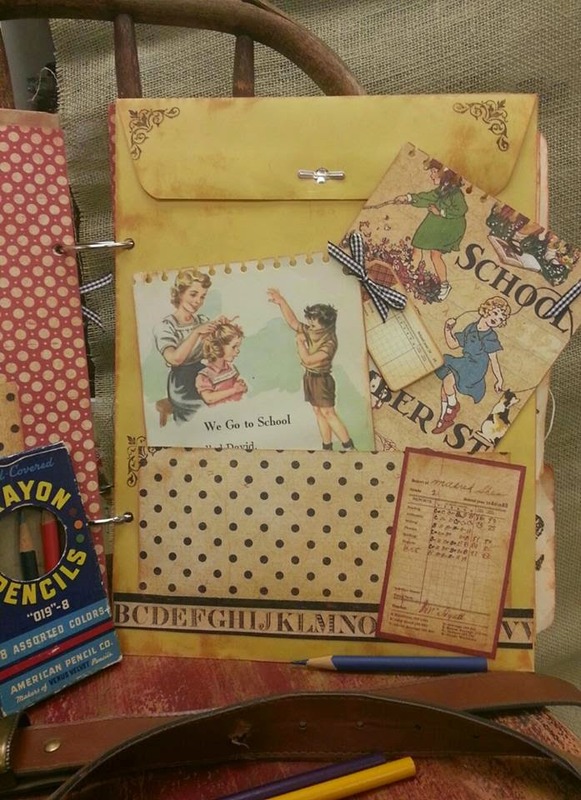 I also added manilla envelopes for report cards, awards and the like. I used large file folders for the class pictures and other photos of friends. 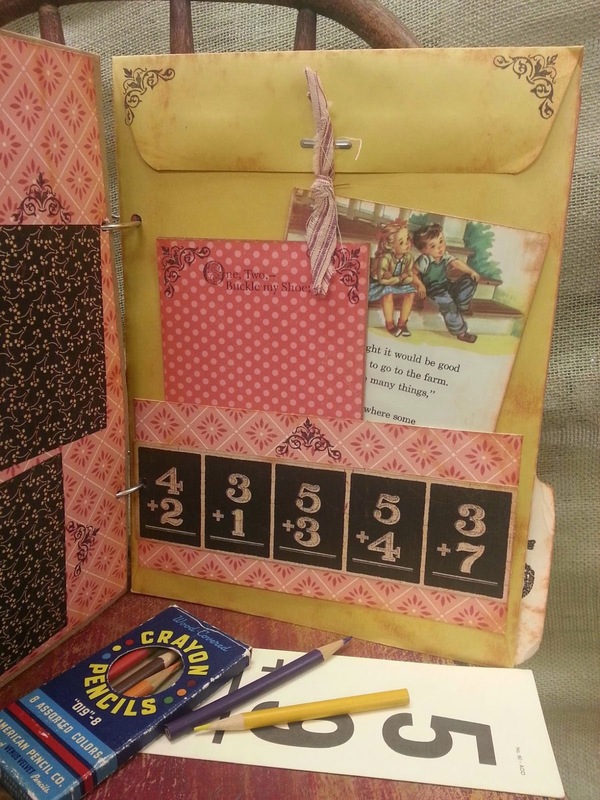 There are different places throughout each grade section to put pictures of him and to write special things that happen during the school year. 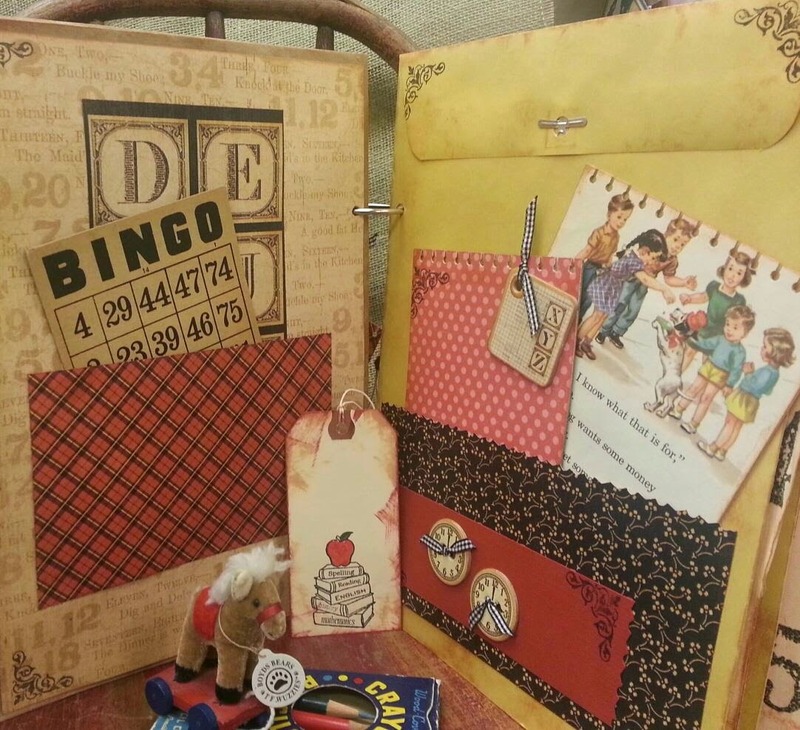 Each year also has a place to add a class picture on a large file folder. 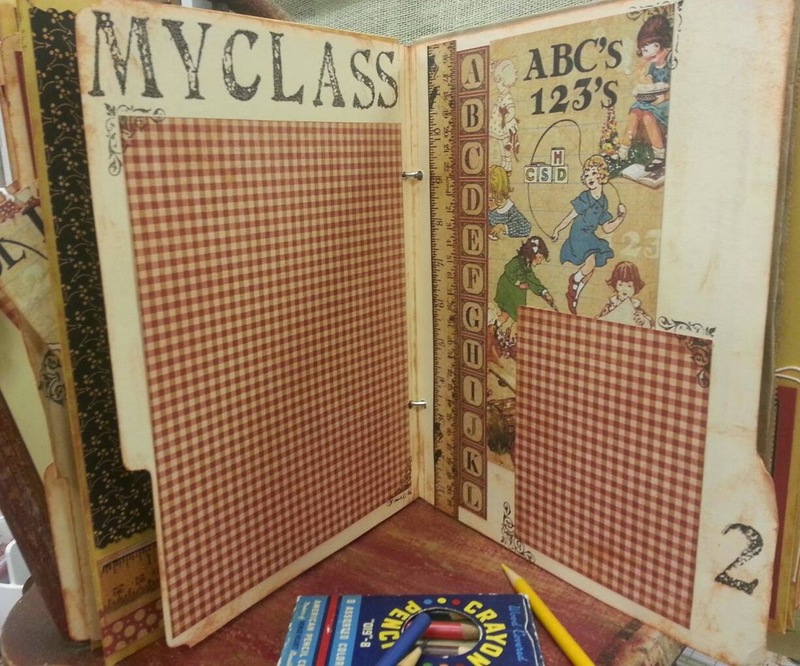 I also used pages out of an old school primer book. 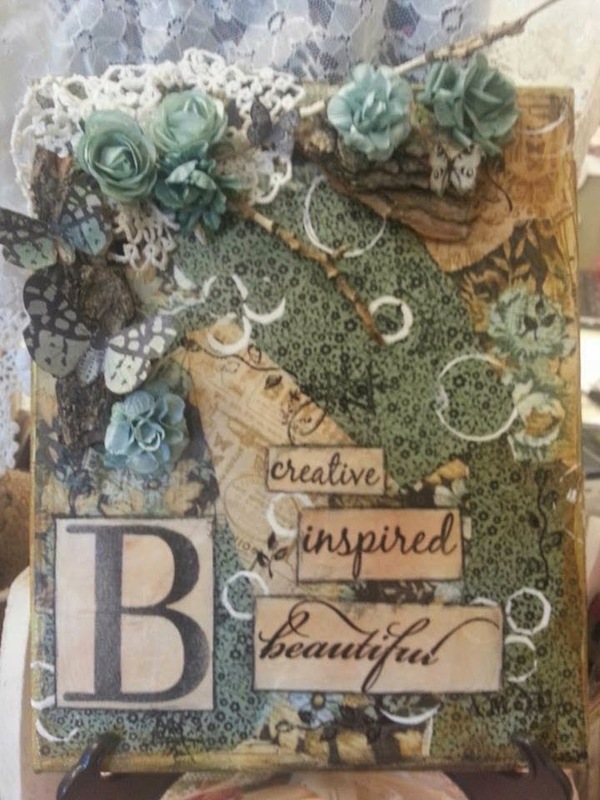 This is a make-n-take class I did in my store. 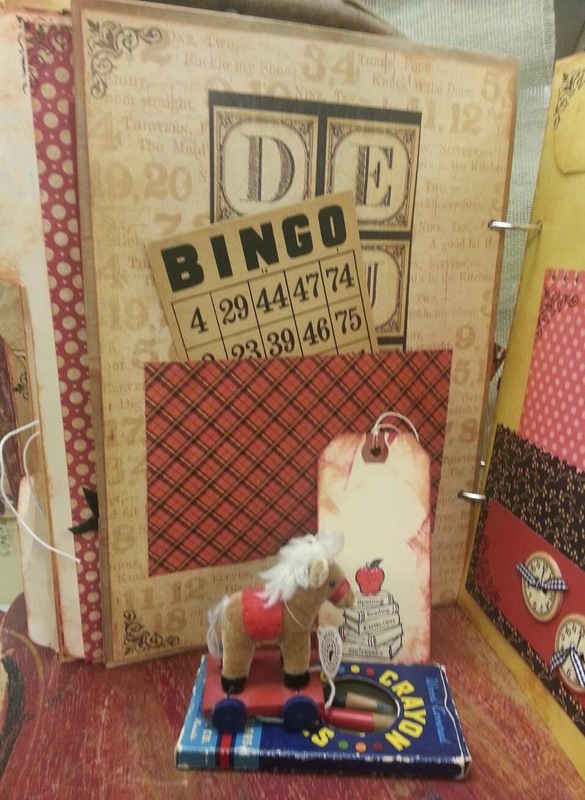 Using an old Bingo card and scraps from the G45 ABC Primer paper line along with some chipboard pieces. 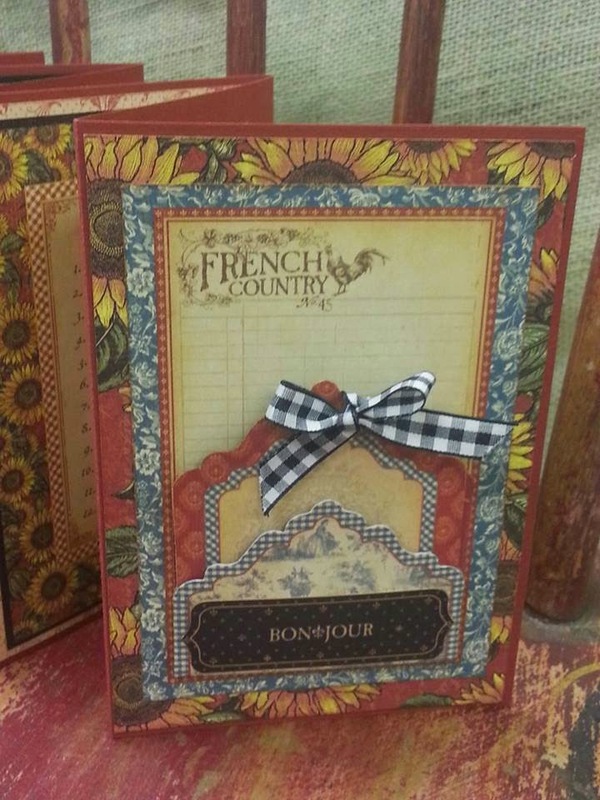 Using the G45 French Country line I created this Accordion book. 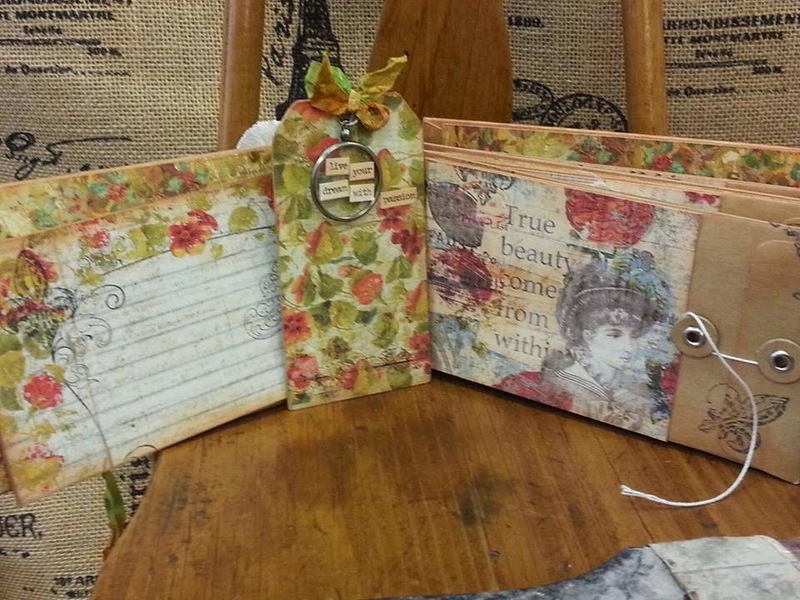 I also used the tags and pockets to keep special little memories in. 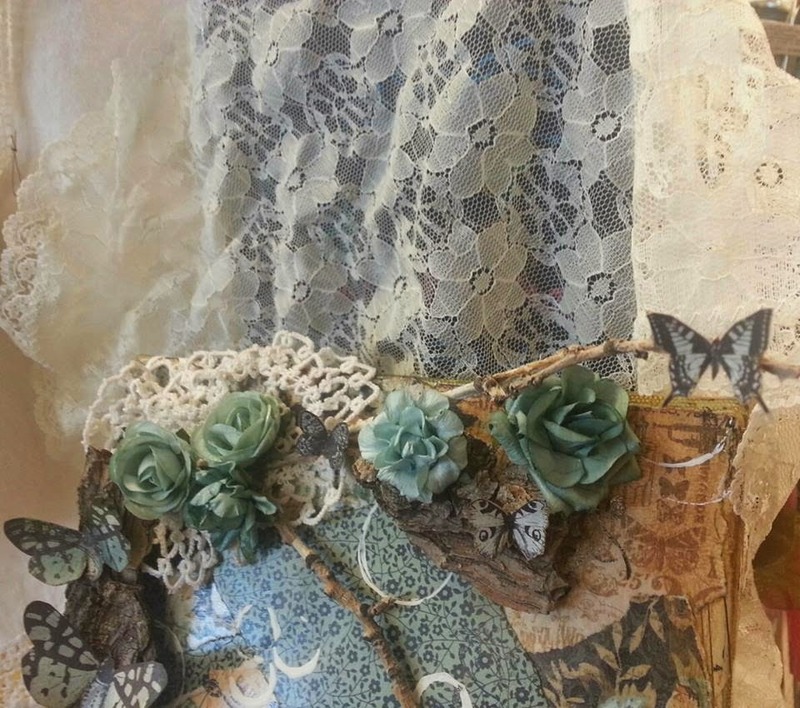 Embellishments include buttons and Petaloo flowers. 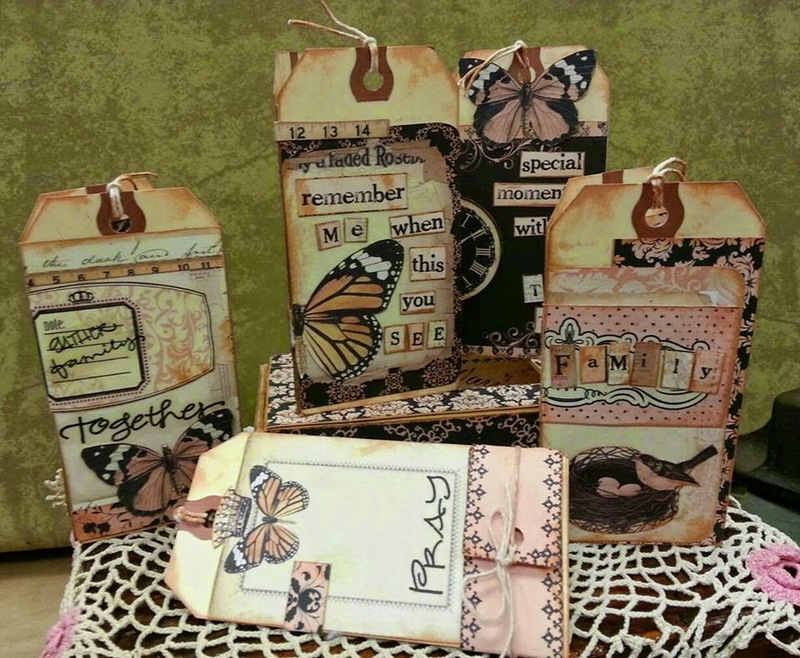 I also added lots of tags and pieces for journaling. 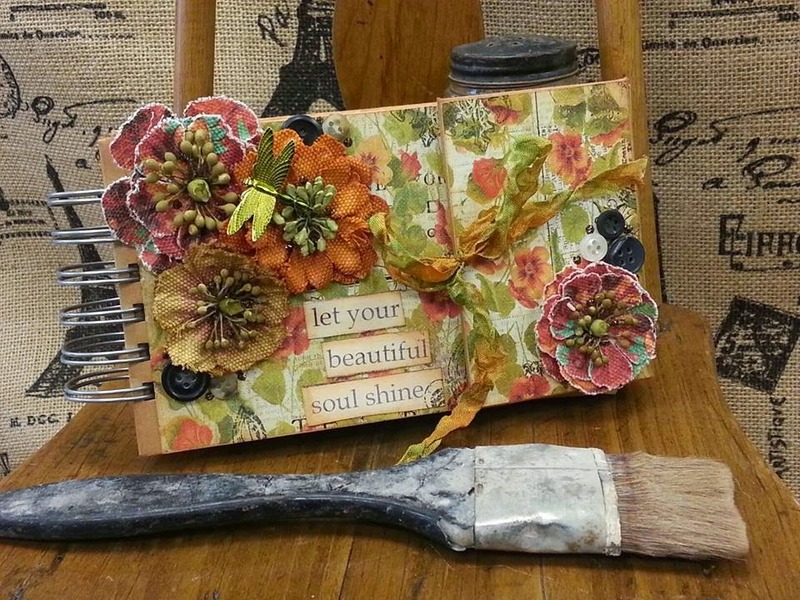 I love creating mixed media canvas. 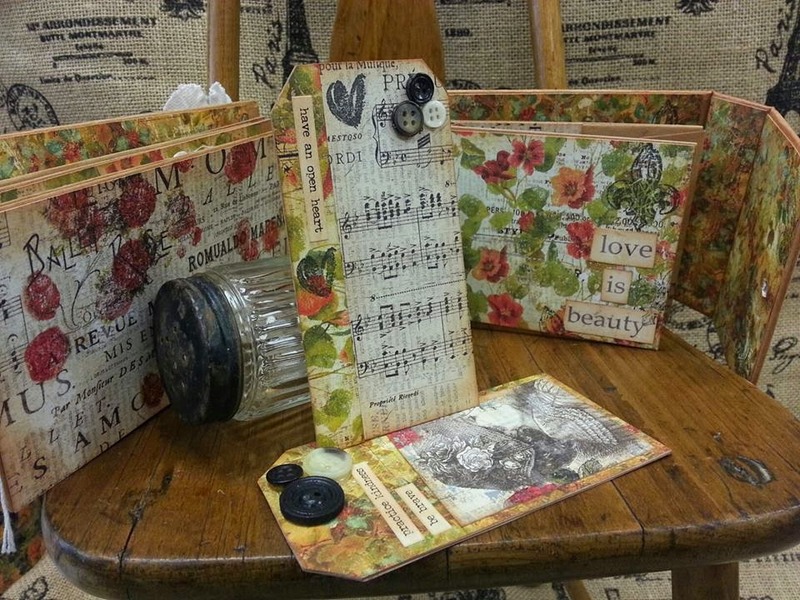 I used an 8.5x11 stretched canvas, painted it and decoupaged vintage music and paper over the top. 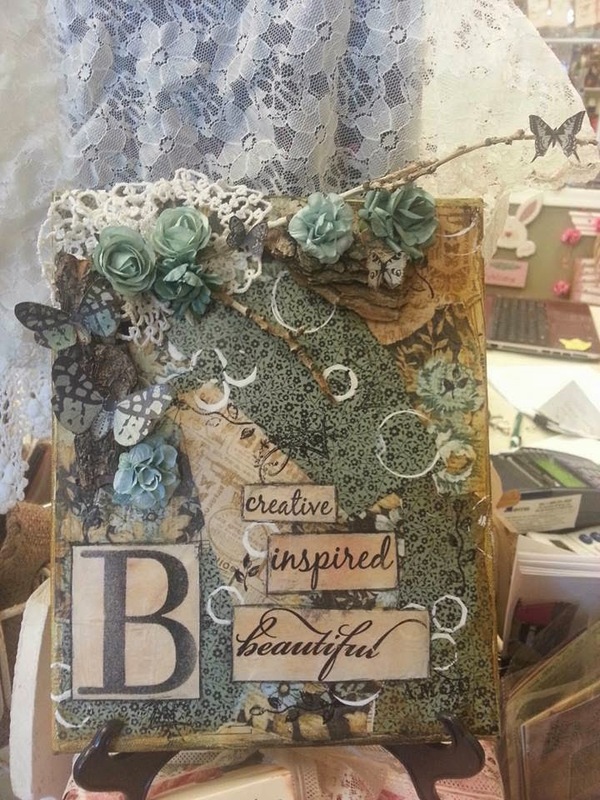 I added the words and natural elements such as bark and twigs, flowers and butterflies. Close-up of the top. 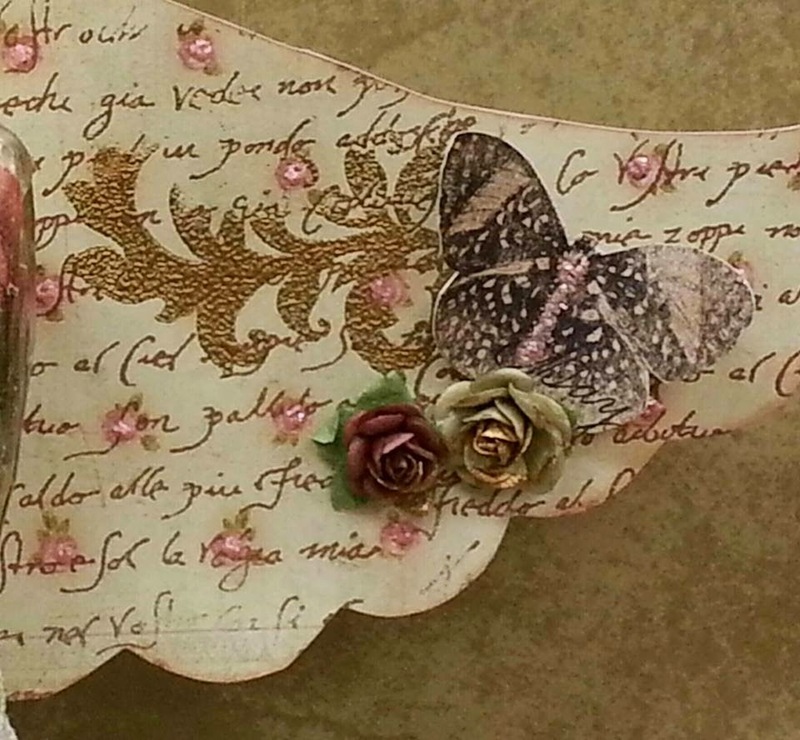 Note the fussy cutting of the fanciful butterflies. The completed project with the little butterfly laying on the twig. 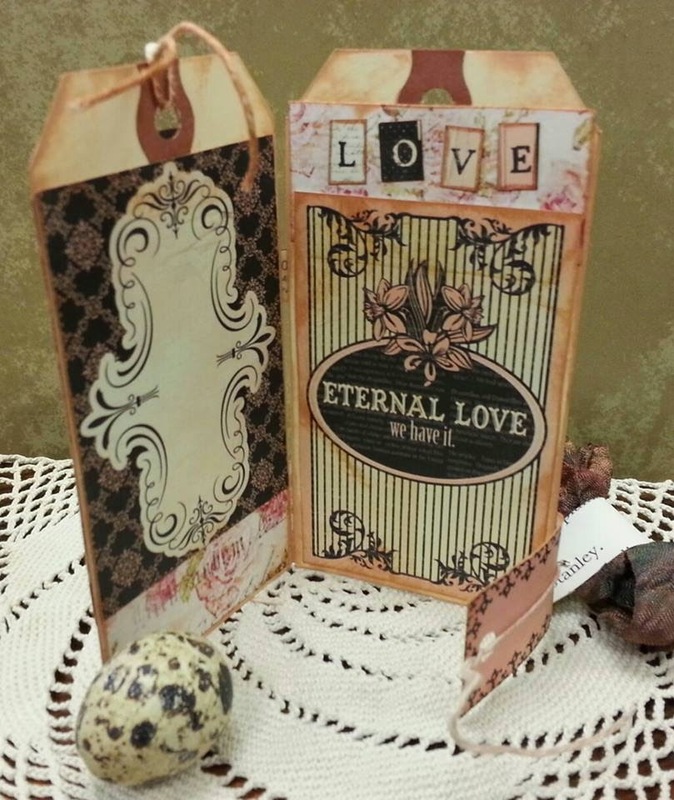 Made with a G45 small matchbox and Prima Almanac paper. 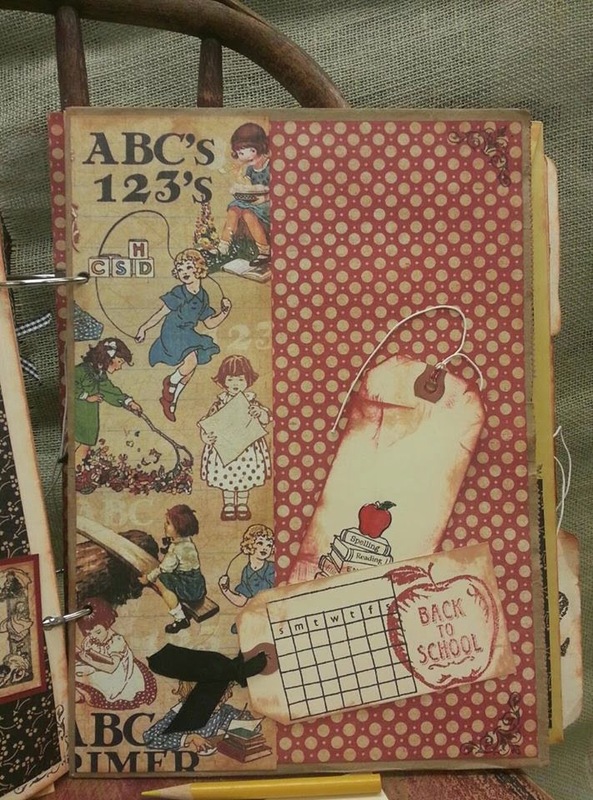 I used manilla tags to make the little "books" I used different elements from the paper to put the tags together so they open up. 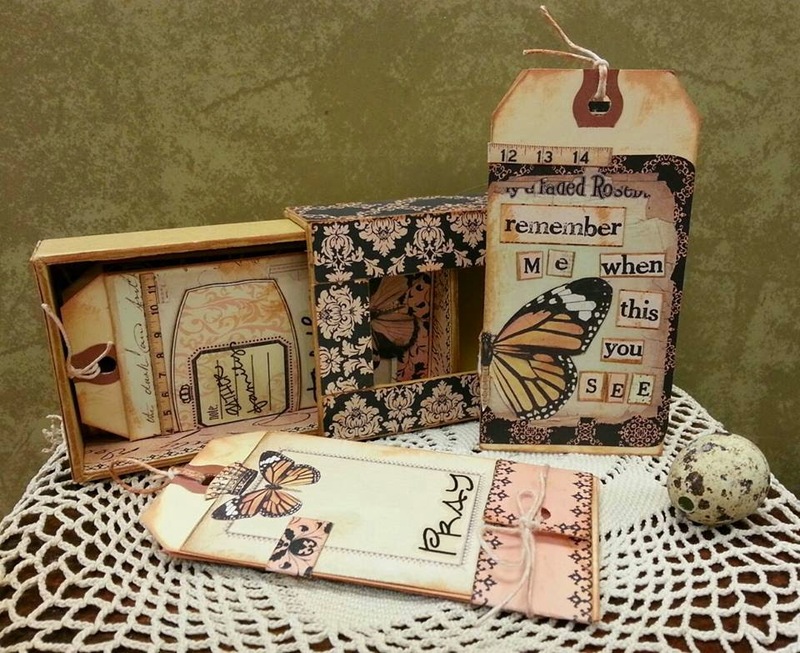 For example the large butterfly, a clock, a frame etc. I added words that pertain to families, Pray, together, family, Love...etc. All of the tags fit into the box. I left some open spaces to add pictures. I also covered the box and distressed it. 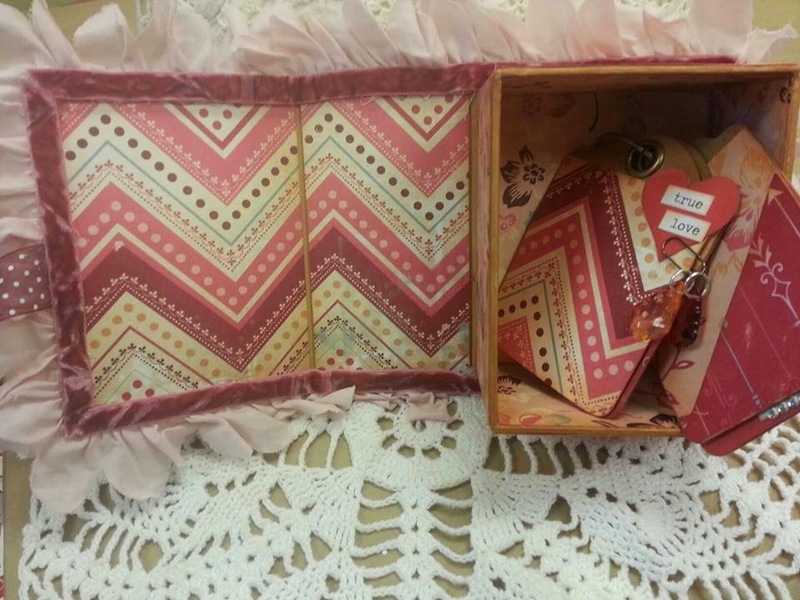 Here is one of the tags open...it has a wrap around paper closure with a tie. 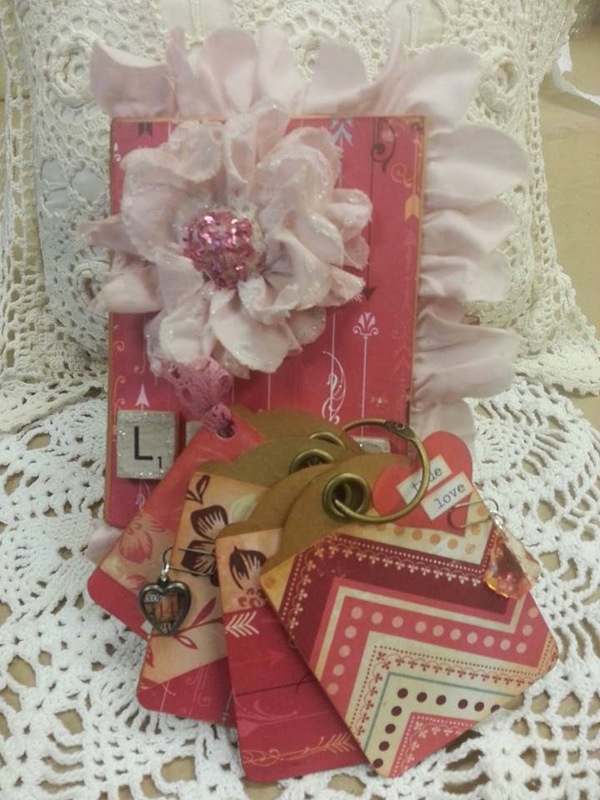 This was one of my store Valentine's Day classes. 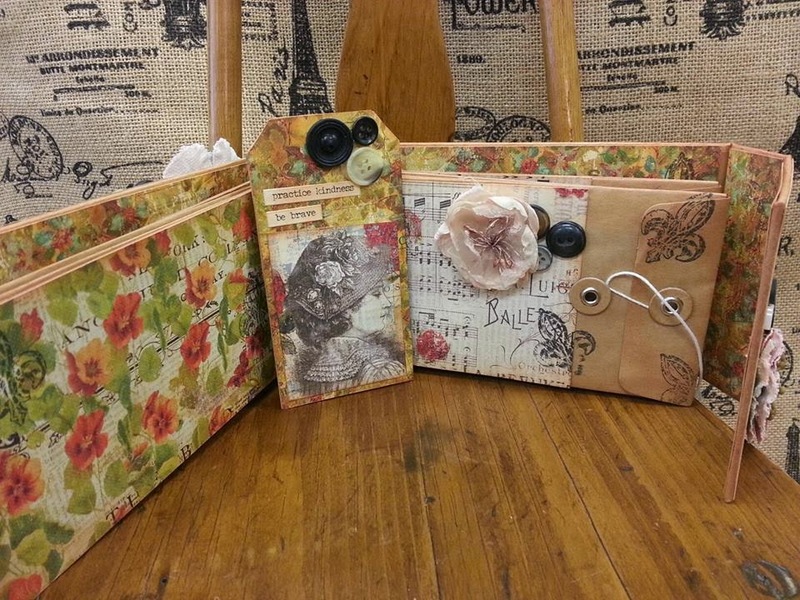 I used a G45 Book box and tags. 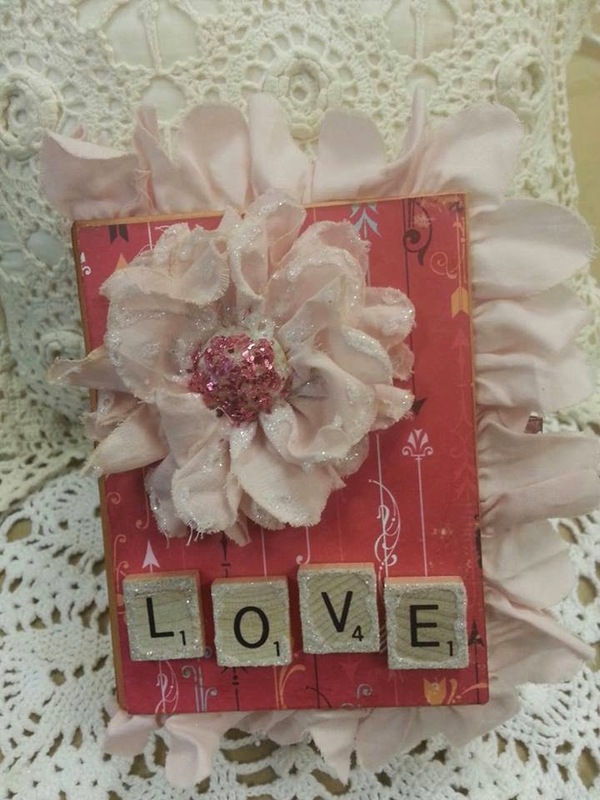 I also used some metal embellishments and scrabble letters for the front. 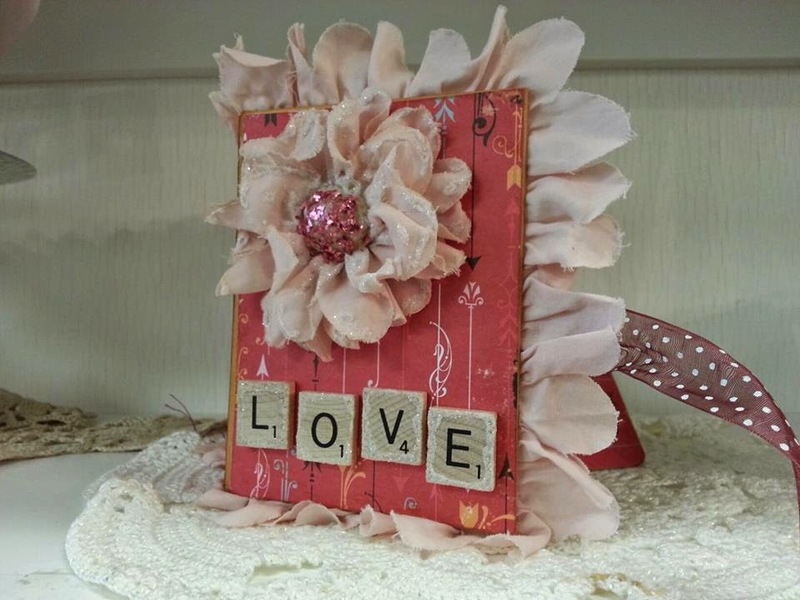 I used a pretty pink petal trim for around the box and used the same trim to make the flower. I used a large button and glitter for the center. 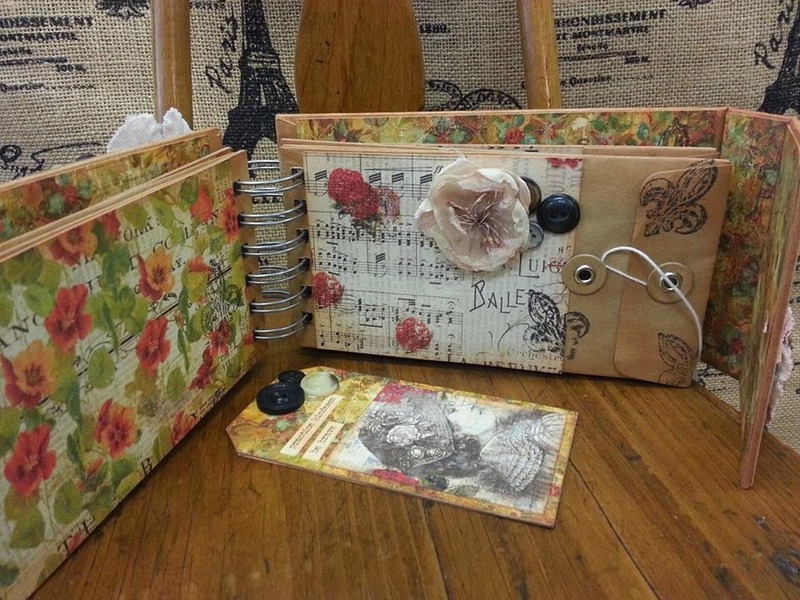 The tags will hold pictures and love notes. Also a nice space to write a poem. 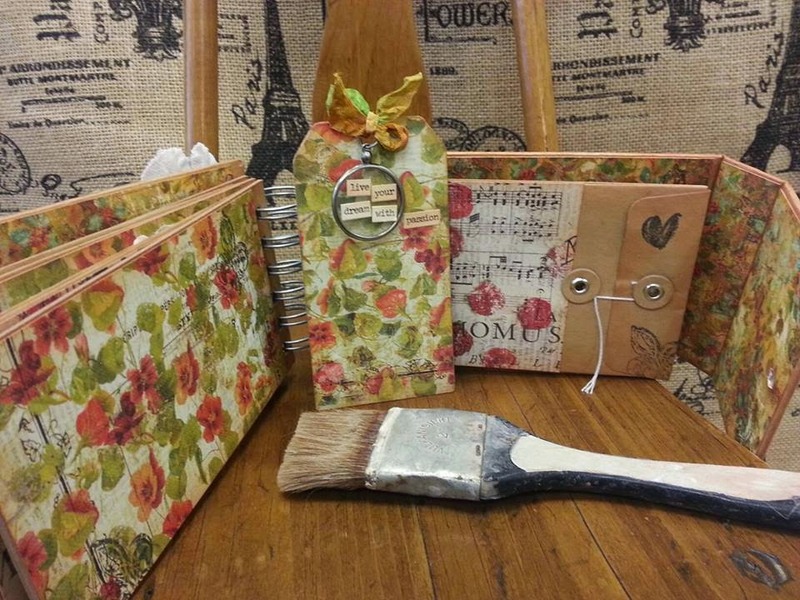 Prima Genie Stones, Tim Holtz mini clip and heart as assorted bling. I covered the entire box with paper. I used a crushed velvet trim on the inside. 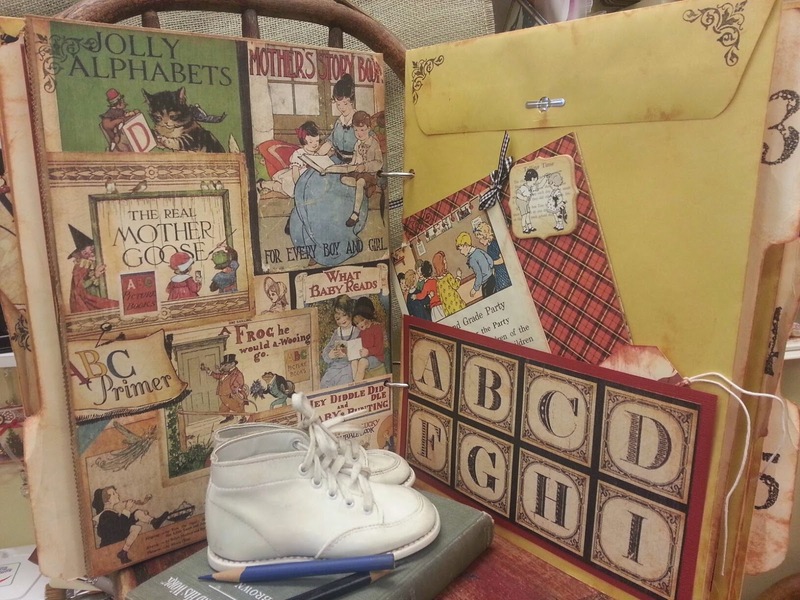 Graphic 45 Mother Goose Nursery set. 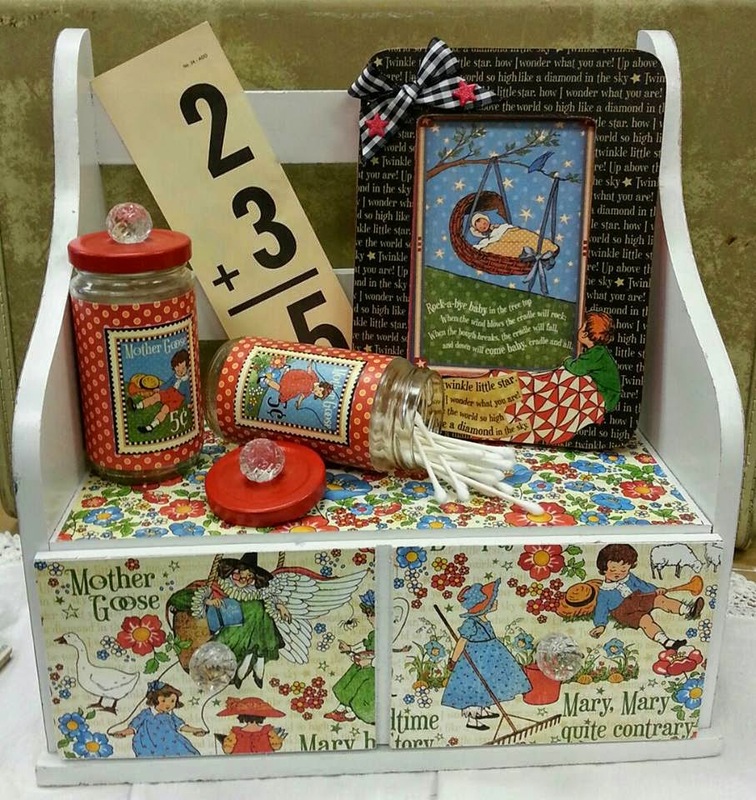 For this sweet set I used the G45 Mother Goose line. 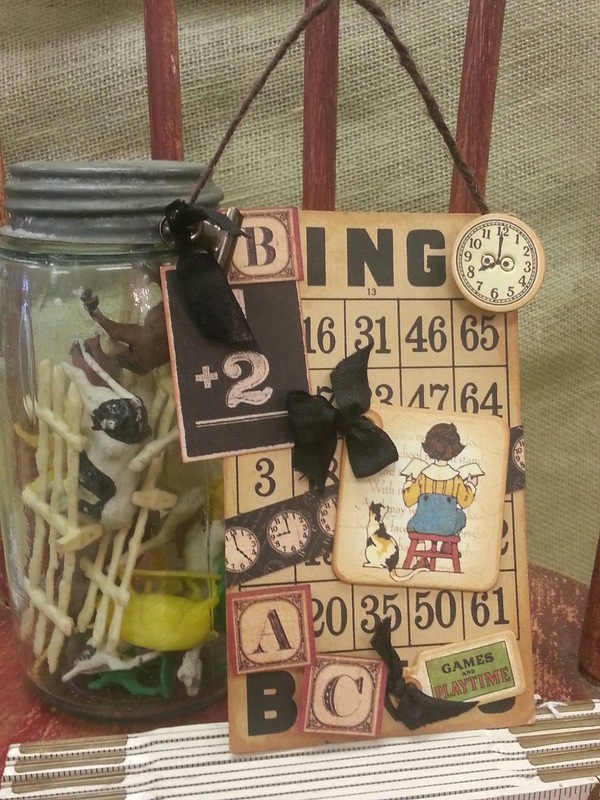 (One of my favorites:) I covered the frame and used a card from the 12x12 Little boy Blue as the picture. 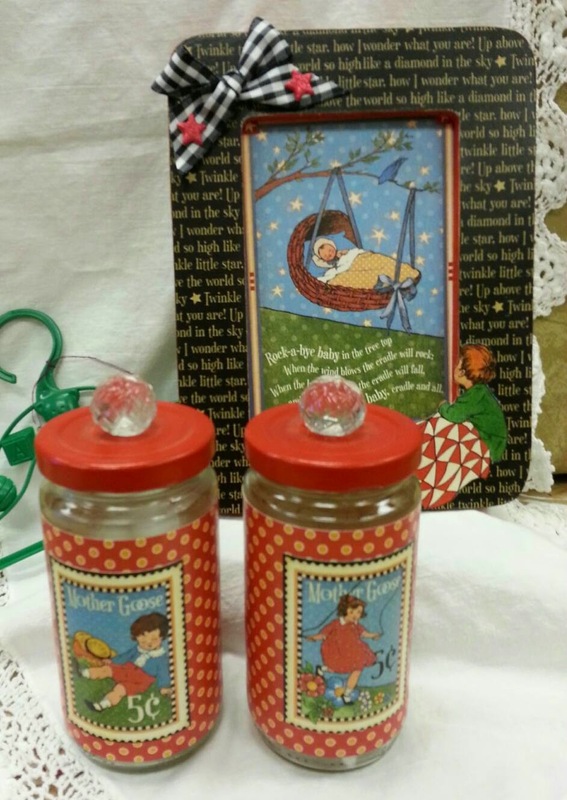 I covered the jelly jars and added glass knobs to the painted jar lids. These can be used for cotton balls or other little things babies need. I fussy cut the baby in the swing and the poem below and used pop dots to give it more dimension. 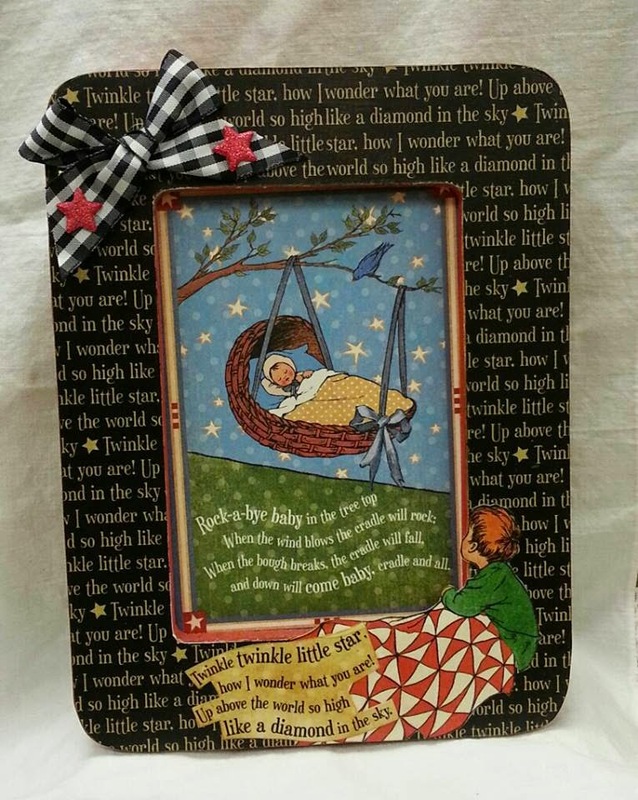 I also fussy cut the little boy on the frame itself and the poem. 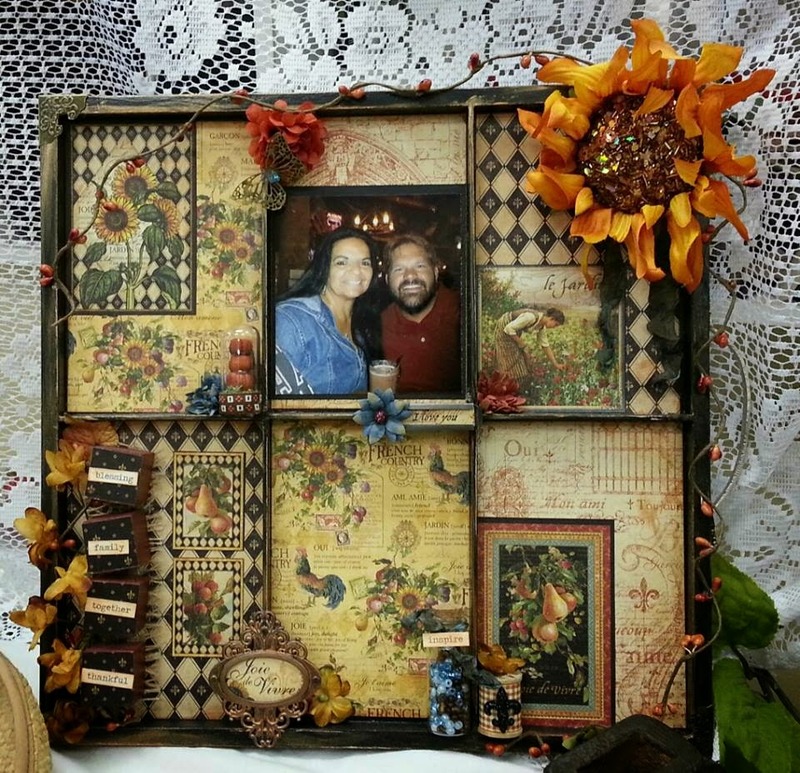 I used the G45 French Country paper for this shadow box. Another one of my favorite lines. 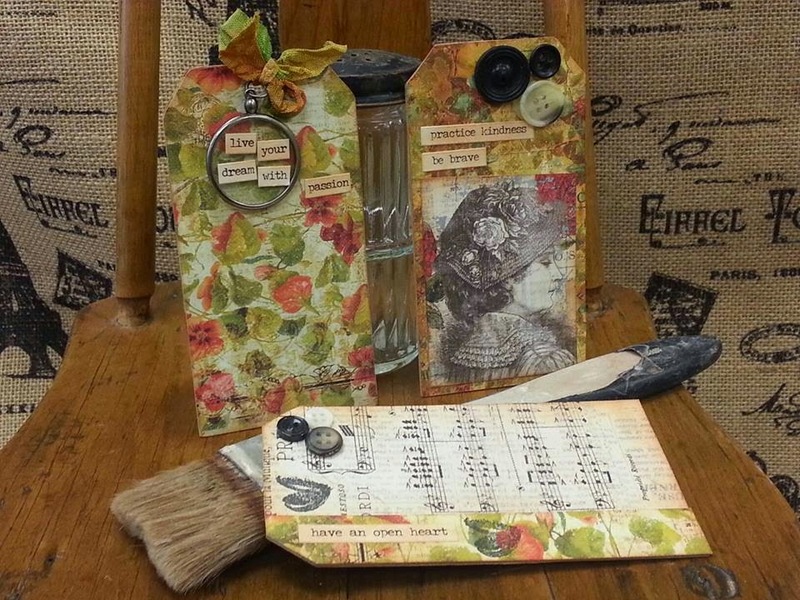 I embellished the project with Petaloo flowers, Tim Holtz domed cloche with mini pumpkins, painted small wooded blocks and added Tim Holtz chit chat words, a corked vial with beads, and a small thread spool. Additional photos can be added. 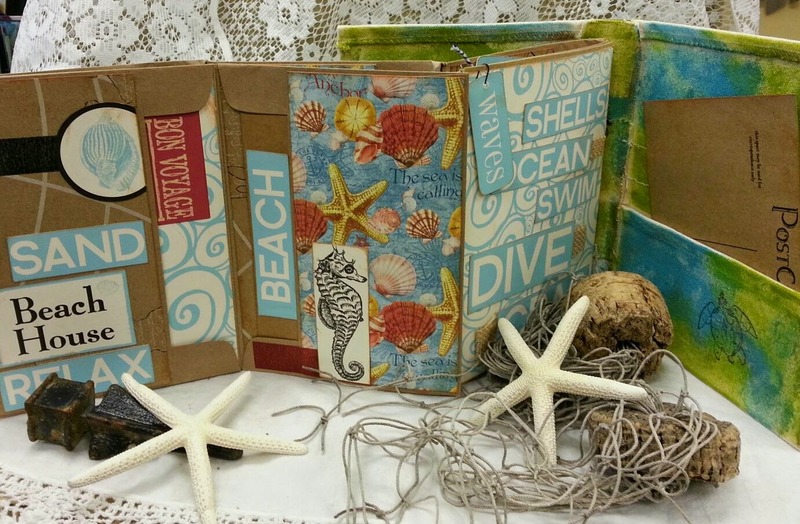 This is a canvas book with fold out pages...made by Canvas Corp. 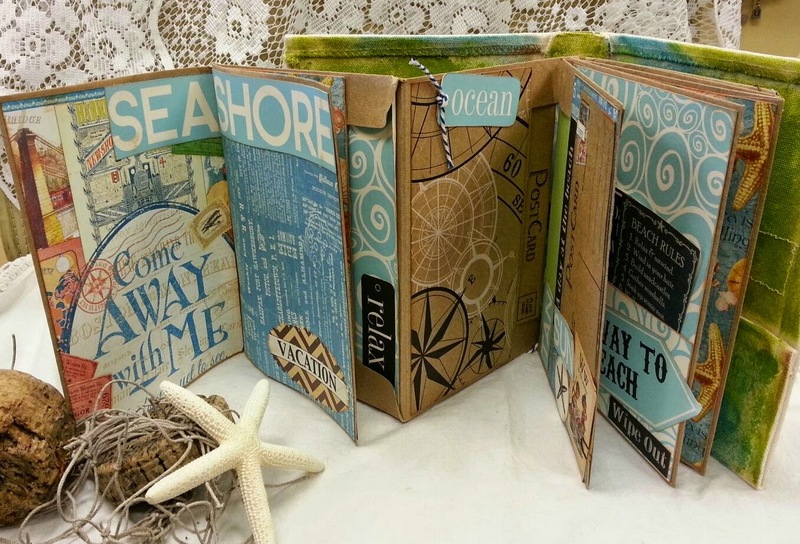 It came with some paper but I added the G45 Come Away with me and By The Sea paper lines. I really love the added colors. I also painted and stamped the canvas. 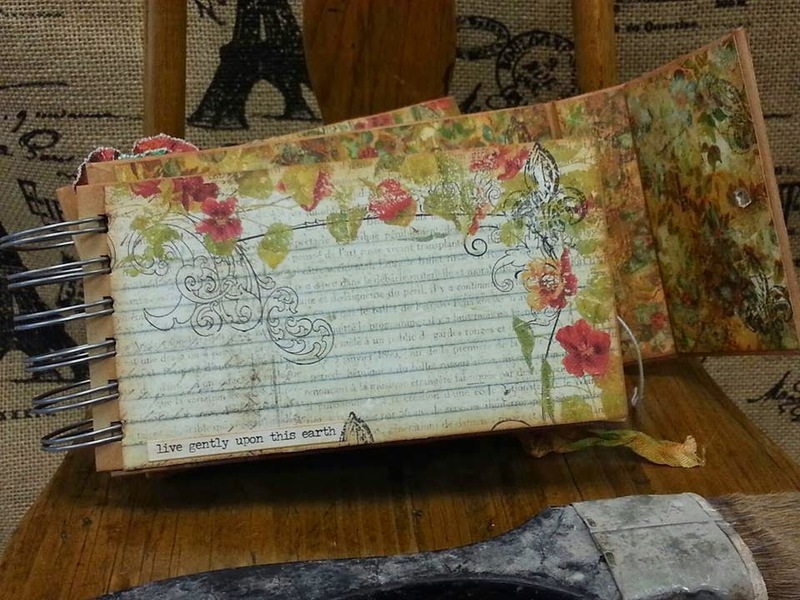 I designed both sides of the inside pages. 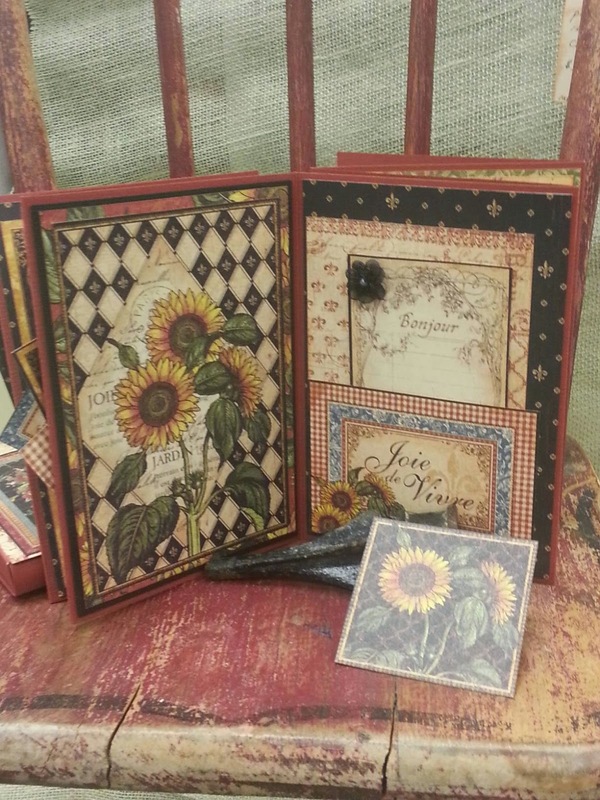 Lots of space for pictures, journaling, tickets and little treasures. Meet Millie, she's an angel. :) I named her Millie because I was thinking of my grandmother when I was making her. 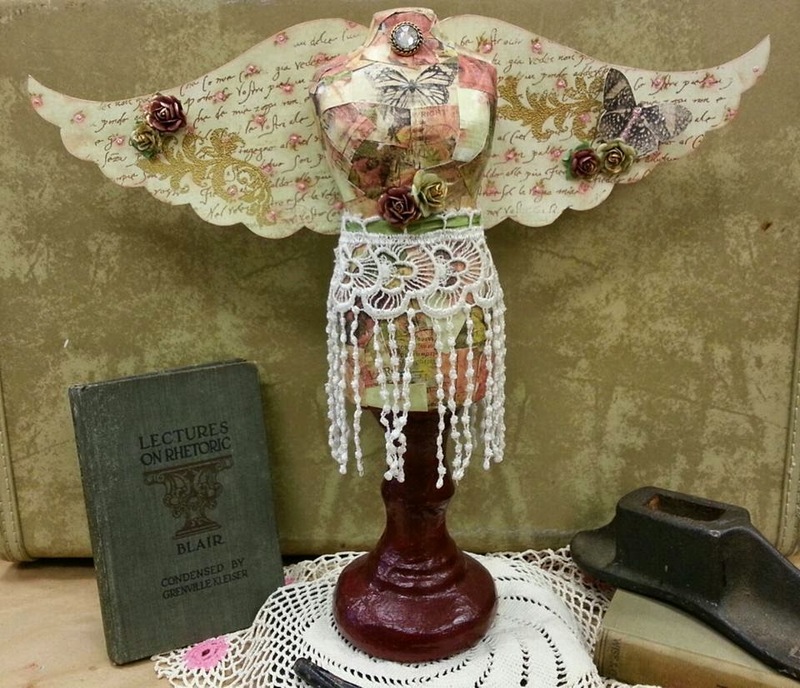 She is a paper mache dress form decoupaged with Kaiser Kraft papers. The handmade wings give her a bit of a lift. 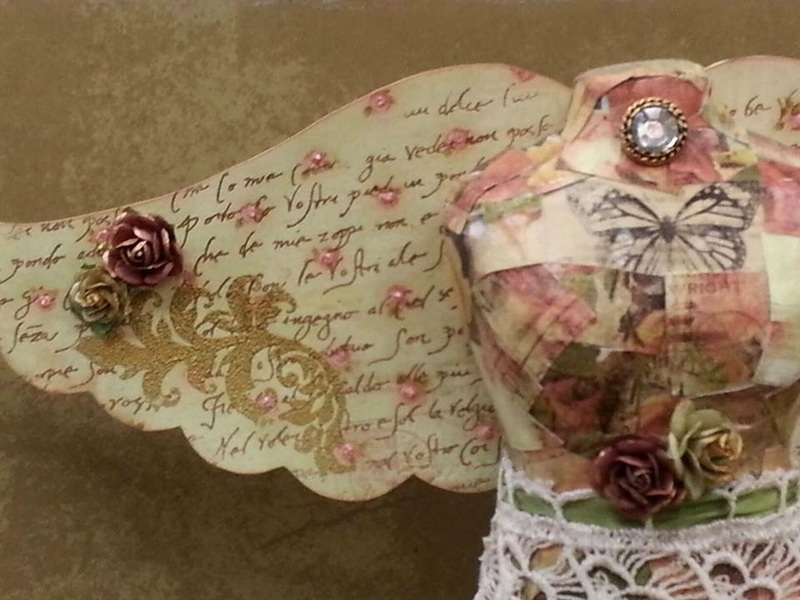 :) I added some embossing to the wings along with added flowers, butterflies, and some bling for a necklace and a piece of vintage lace for her skirt. I adhered paper flowers and a butterfly. I used pink stickles to give her some sparkles. 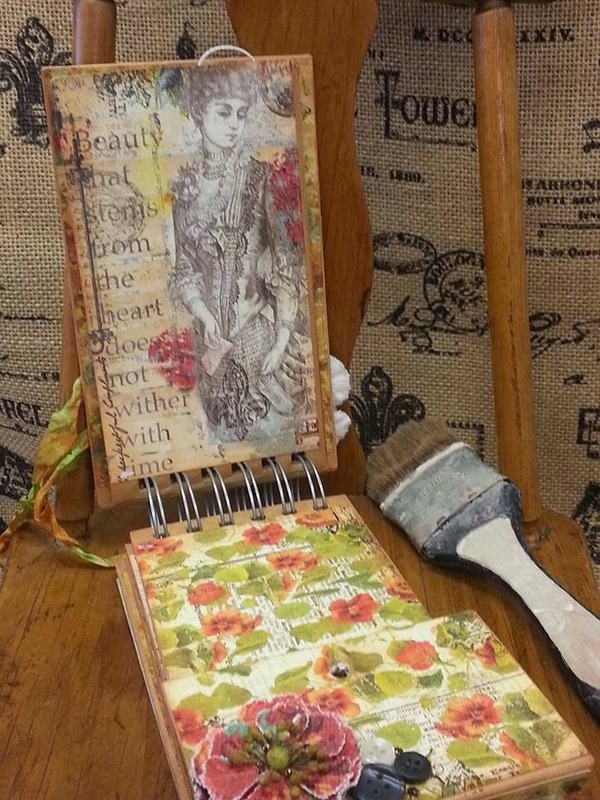 I made this book for my favorite pictures of my mother. It's beautiful and strong like she is. 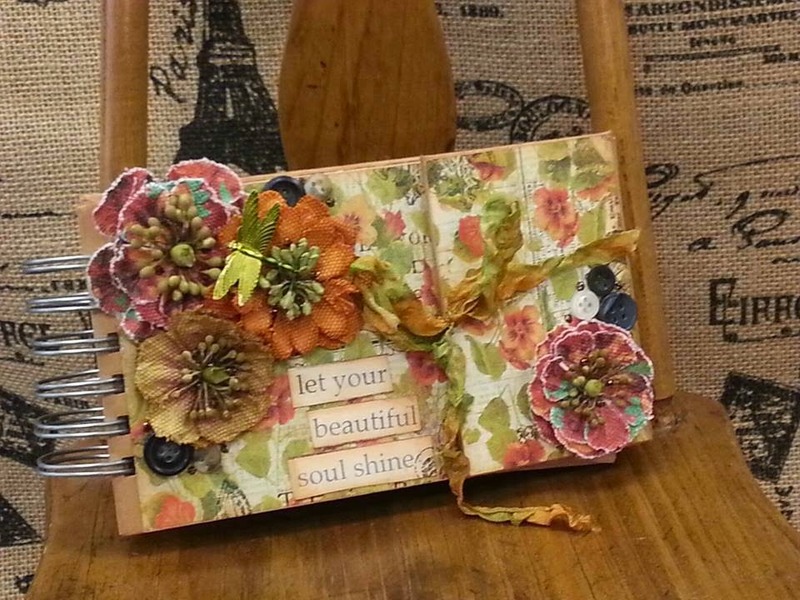 The book is from Farm House, the paper is Prima Bella Rouge and the flowers are also Prima. The trinket dragonfly charm is colored using Ranger Alcohol Ink. 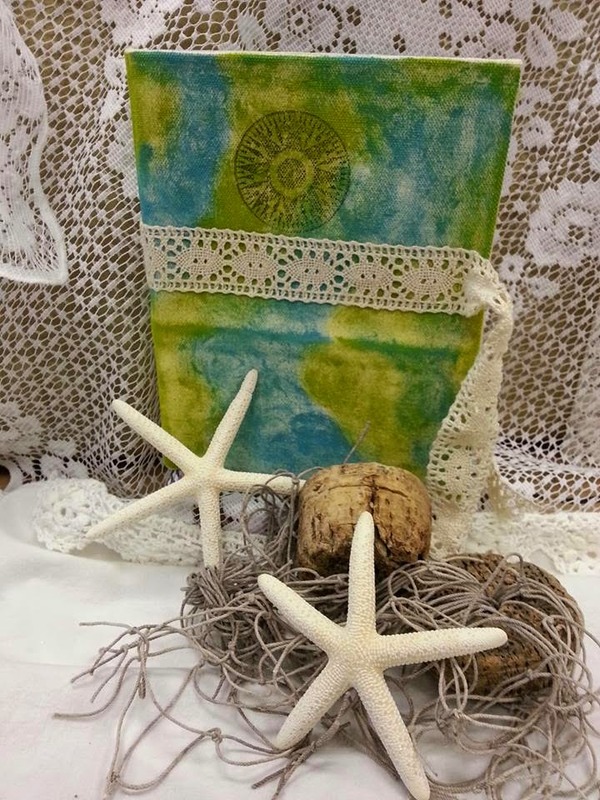 The vintage seam binding ribbons is hand dyed using Lindy's Starburst spray in several colors. 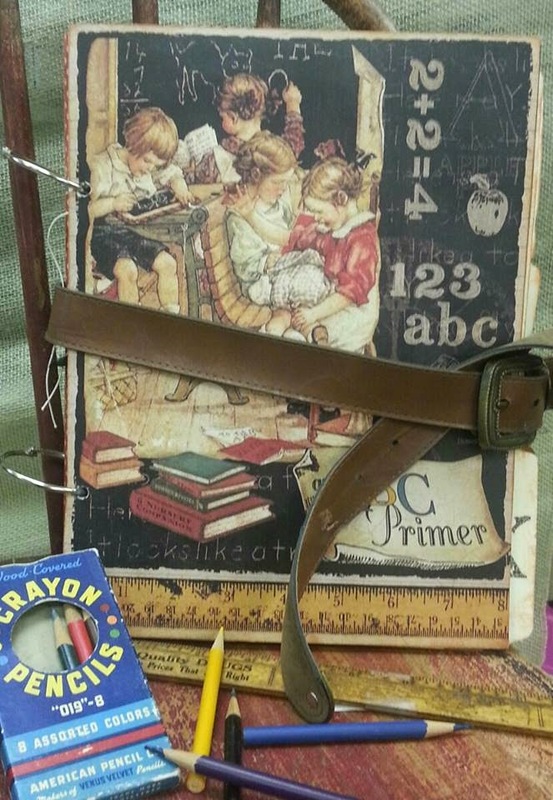 The book has 3 pockets inside. 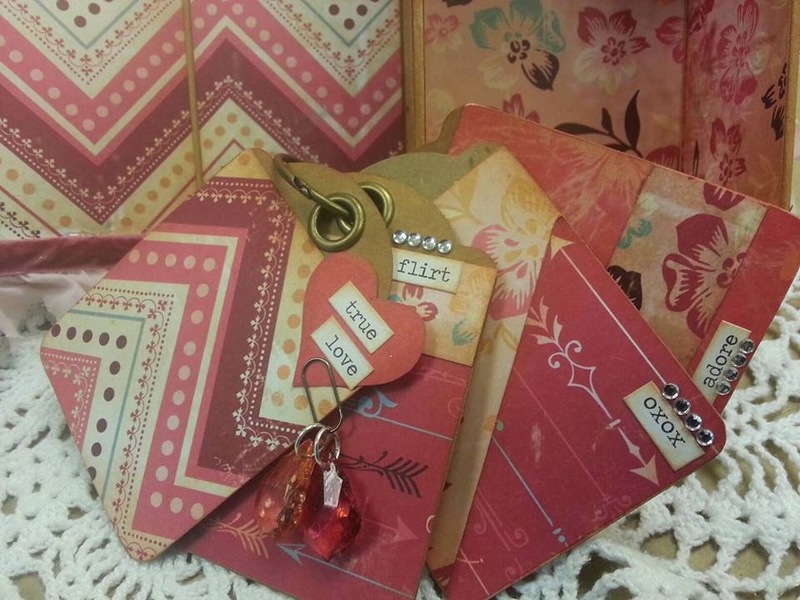 I made tags to fit into each pocket to add more pictures or journaling. 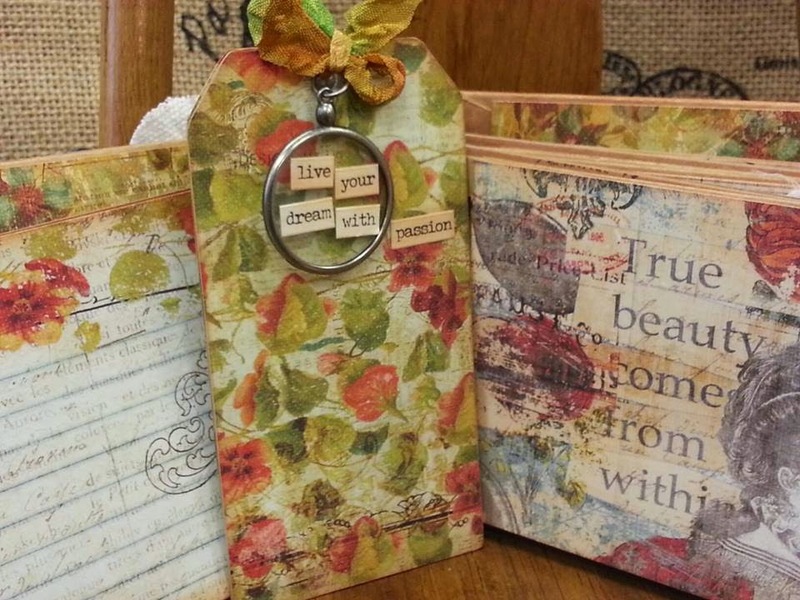 I used a Tim Holtz monocle and chit chat-"Live your dream with perfection"
The 3 tags that go in the pockets. 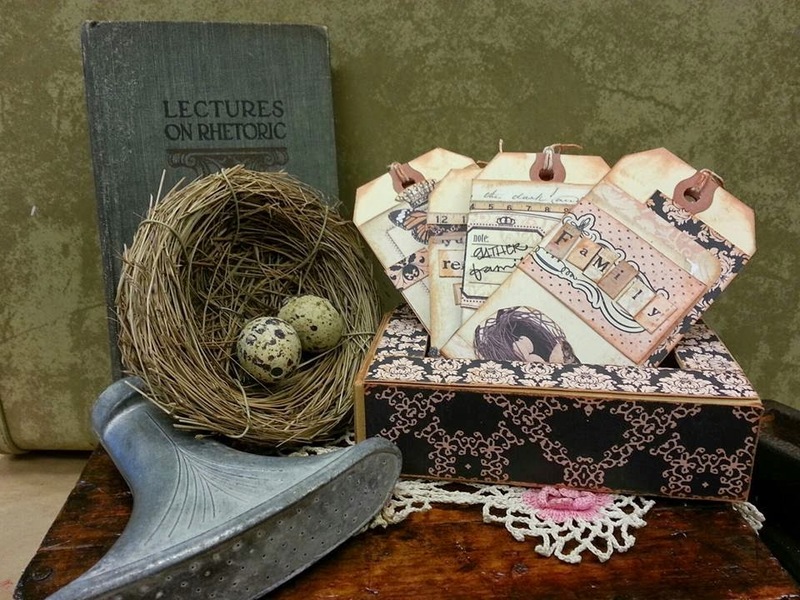 I added some vintage buttons and more chit chat. 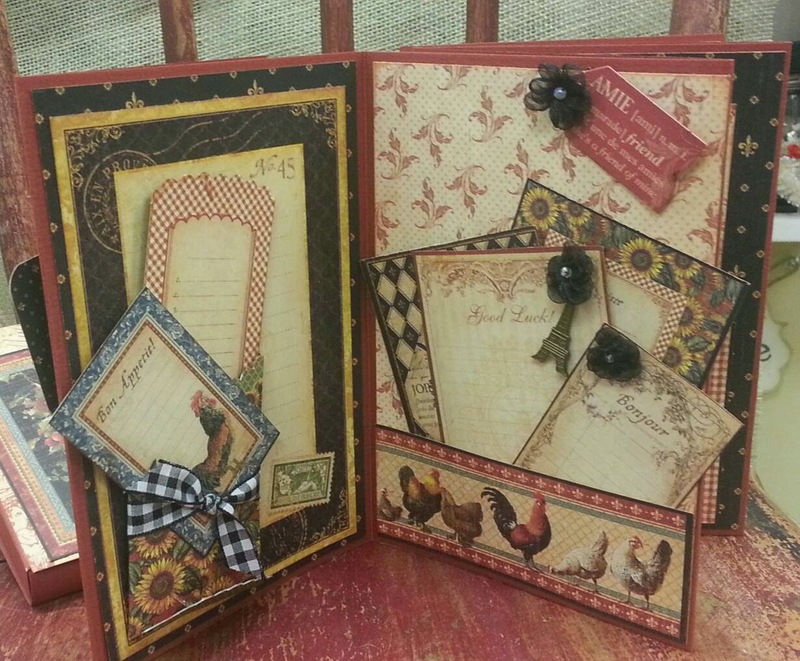 I used a variety of my favorite stamps to add more dimension. 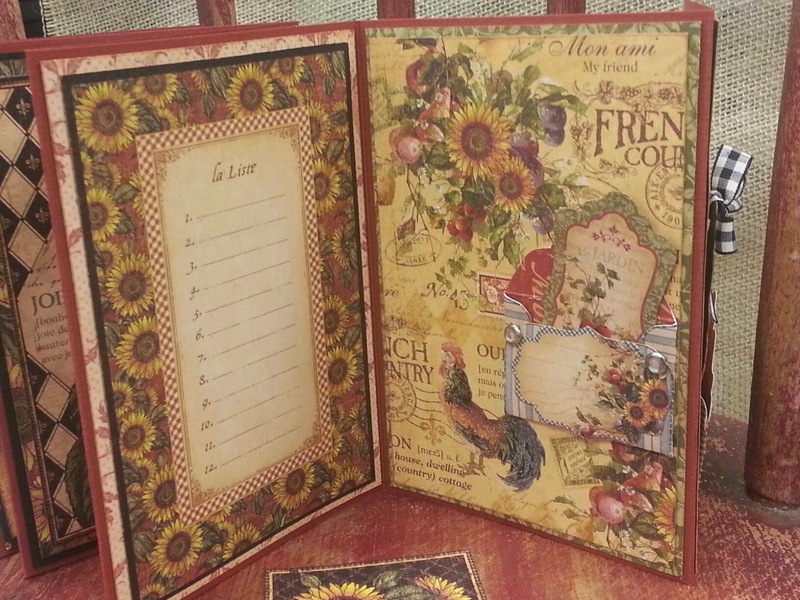 Plenty of space for added journaling and photos. I hope you enjoy and are inspired by my many creative endeavors.